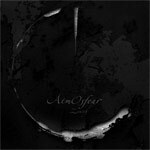 It takes some time for the members of AtmOsfear to pull together a new, about six years apart, exactly. Zenith is their third album, and it's as dark as its bleak, minimalist cover. Over a soundscape of atmospheric keyboards, the band layers textures of music merge melody with quiet melancholy, near despondency (Loss of Hope, Scum of Society). Zenith is not gloom and desperation like doom metal, merely ethereal, lingering and foreboding like the Titanic listing towards the iceberg in the cold dark night. If this sounds a bit ominous or creepy, do not be put off. The restless, dark intensity of AtmOsfear's Zenith is desperately intriguing and effortlessly entertaining. Just don't come to this album with a heavy heart or deep matter weighing upon your mind; it may be too much for you. There are some rougher moments within as when AtmOsfear's attempts some harsher vocals. But this only makes the exploration of Zenith an intriguing adventure into an undiscovered country which prog fans will love. Dark, dense, and deeply intriguing, AtmOsfear's Zenith is like exploring a great undiscovered country with trepidation and intrigue: a delight for prog fans everywhere.